In a world where everything is settled in a good fight, every warrior wants to have a chance to enter the Fighter League. Henry Forge is a member of that league, and a descendant of a great family of fighters. His sole desire is to finish what his family started, and meet the enigmatic Architect, creator of the Colosseum, and be inducted into the Hall of Champions by his own merits. Fight, train, and meet comrades on your way to the top! Experience an adventure where choosing, and developing, the right members of your team really matter to be victorious in battle! Learn about the creation of the Fighter League and the Colosseum. Unfold the story about Henry and the members of his family with encounters of great characters in a world where everything can be solved by fighting to death! Assemble the best team of warriors and enter in the Fighter League to battle against the greatest monsters and fighters to become the new champion of the Coliseum! Fight and win all the Leagues to acquire Fans and Trophies to earn your place in the Playoffs. Each League features new challenges with new enemies, game mechanics, boss fight, rewards, secrets and characters to uncover. This game will be weekly updated with more content choose by you, the gamer. Weekly vote pool will be available to choose which new content will enter the game. (New leagues, equipments, characters, secrets and more) A game where the player can choose what will be there next challenge and some other surprises! Use strategies, great skills and magic to defeat your opponents in this homage to classic RPG Gameplay mechanics with new features from today. Only the strongest and wisest fighters can defeat all the Leagues. 30 Hours + Game Length with new free content each week. Fight in Leagues with challenges, boss fight, crazy enemies, moving story element, surprises and great RPG gameplay mechanic and full of secrets. 1 to 6 party members in your team for intense and strategic battle. More than 16 playable characters all with different abilities, magic and great personality. Develop your Friendship with your comrade in RPG Fighter League to obtains new skills, items and more! Choose and give Stats Boosters to your characters the way you want them to be. Learn skills and powerful magic to become the ultimate fighter with more than Gaziillions of possibilities! Find NPC and repopulate the Hall of Champions and develop your friendship with them to have even more things to learn and buy from them. A great story about fighters & family and everything around the creation of the Leagues. Great Characters in a light hearted world where the fighters are the superstar of the Colosseum. Fans system where you gain fans with trophies in League to obtain all sort of advantages and buff for your team member. 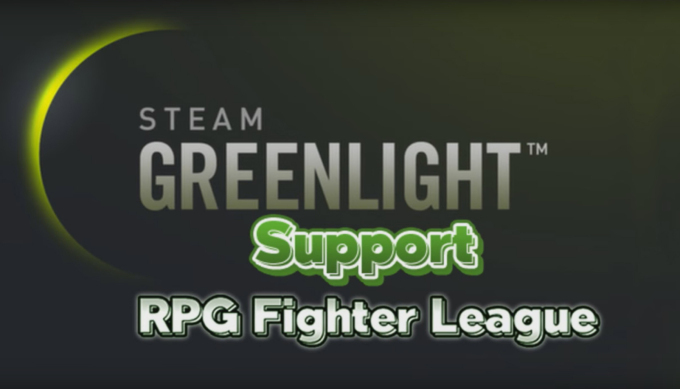 Just a quick message to announce you, that RPG Fighter League is now on Steam Greenlight program. With your support I'm sure we can make a great RPG that will be loved by gamers all around the world. New Demo for RPG Fighter League with more content, bug fixes, weapons, characters and adventure for all the Fighters inside the Colosseum. UP! I'm still alive after all that time without saying something about the game. My life have changed a lot since the beginning of this project, but I want to make sure that I will finish it somehow someday and continue to develop and iterate on the game to make it a fun and worthwhile experience. You can still try the demo or go over steam to buy a early access copy and let me know what you think about it. I'm still working hard on my RPG Title! The fight is not over yet, I'm still making some balancing tweaks and adding new leagues for all the players who want to try the challenge made by the Architect. More news to come in the following weeks. I hope I will be able to give you access to the game in the next few month so we can build a even better one with your great feedback. Hi everyone! Thanks for you support! Please help me and vote Yes for RPG Fighter League on Steam Greenlight. Don't hesitate and try the demo of the game, to have a sneak peak of the overall game. Have fun! I will update a new demo each week of this project with new content and you will be able to copy and paste your save files so you can continue your epic adventure in RPG Fighter League. Have fun!